Apartments in Exquisite SouthWest Portugal, West Algarve. 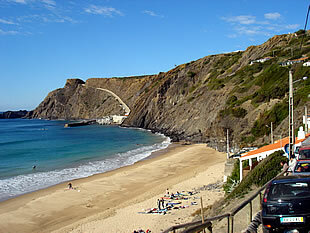 Arrifana is a wonderful beach town that offers excellent surfing in a well-protected cove along a wide sandy beach. There are several restaurants serving fresh seafood caught right from the small Arrifana port. Arrifana is close to another great beach Monte Clerigo and a 10 minute drive to Aljezur, a little town connecting with many other well know beaches such as Amoreira, Odeciexe and Carrapateira. If you are interested in learning to surf, then Arrifana is a good place to learn and has good waves for surfers of all levels. There is a good beach break, which is easy to surf. When there is a bigger swell it is possible that the point break starts working. Its called the 'Kangaroo'. This is for more experienced surfers, its a good size wave that breaks for a long way. For surf camps, surf board rentals and surf lessons click here.